Aramis Garcia made no question about where his priorities are following a fantastic debut performance for the Giants. After striking out in his first two at-bats, Garcia came back and hit a solo home run in his third at-bat to lead off the eighth inning and put the Giants up 2-0 with his family looking on. The team batted around and he came back up to hit a two-out, RBI single later in the inning. Following the game, Garcia said having his family there to see the home run and watching their reactions to it was incredible. Garcia didn’t pretend for a second like he was expecting to hit a home run. As is customary when a player gets their first hit as a home run, Garcia had to negotiate for the ball back. He rebuffed the initial offer, but eventually reached a deal with the fan who caught it. 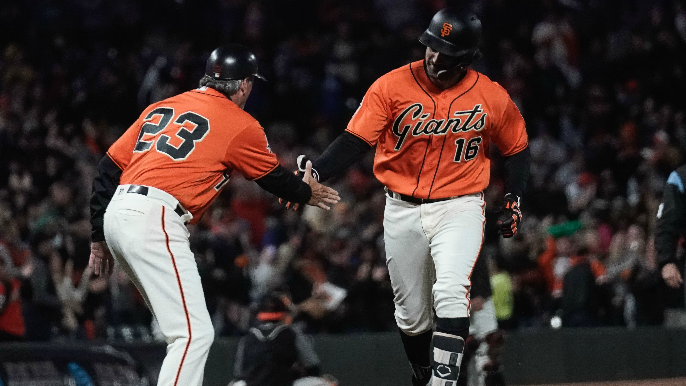 The two hits that Garcia pulled off in the eighth also put him into the Giants’ record books, according to Andrew Baggarly. When asked whether the ball would go to his dad, Jose – who also goes by Aramis – Garcia was blunt.